At least one of you must have been a resident of Wisconsin for six months before the filing for divorce in Wisconsin. A Judge finalizes your divorce by signing the Judgment. 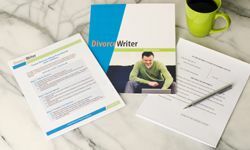 DivorceWriter provides forms specific to the state of Wisconsin and offers a money back guarantee if your documents are not accepted by the Court. You have qualified to use DivorceWriter to complete your Wisconsin divorce papers online. Select "Continue" to start the interview.